This delicious steak is made in a cast iron skillet and is the perfect meal for dad on Father's Day! 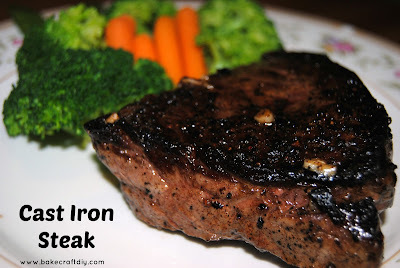 This steak is pretty easy to make and tastes absolutely amazing. 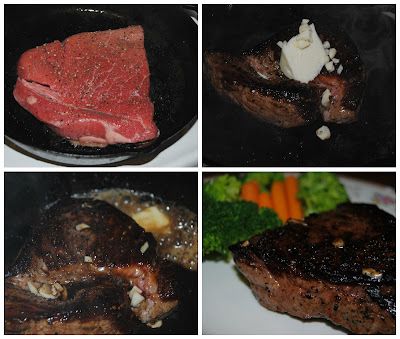 I always start with steaks that are on sale as long as they are boneless you can use this recipe to make the perfect steak in your cast iron skillet. We served out steak with steamed broccoli and carrots. Cooking directions for 1/2 inch thick steak (medium-rare 145°), increase or decrease cooking time depending on your steaks thickness. Season steak with salt and pepper. Heat your cast iron skillet on high heat, add olive oil. When oil is hot add steak to skillet allow to cook for 3 minutes then flip steak and cook for another 3 minutes. Lower heat to medium and add butter and garlic to pan, as the butter melts use an oven mitt to tilt the pan (allowing the butter to pool) and spoon the melted butter and garlic over the steak, continue to spoon the butter over the steak for about a minute. Remove steak from the skillet and cover with aluminum foil, let the steak rest for 10 minutes before serving. I am a stay at home mom to two wonderful boys and I am the wife of an amazing and hardworking man. I enjoy baking and doing crafts with my kids.